Homepage. This page: Read about a range of motorist & cyclist maps offered by Bartholomew's in the late 1920s. "A Bartholomew Map My Guide". The market for maps really opened up as the motor-car became established in the early 20th century, although until the advent of the £100 cars from the likes of Austin, Morris and Ford, new-car ownership at any rate was still the preserve of the rather well-to-do. Illustrated road maps already feature at oldclassiccar in the collecting section, this leaflet is a little different in that rather than being a map, it lists the various maps that Bartholomew's could supply for the 1927 motoring season. 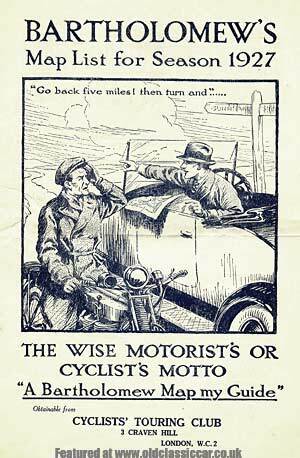 The cover shows a fine illustration of a helpful chap sat in a 1920s tourer, giving directions, from his Bartholomew's map naturally, to a slightly frazzled looking motorcyclist. Note the motorcyclist's attire, a common sight back in the vintage days - leather gauntlets, long warm overcoat, and a non-too-sturdy looking flat cap, to keep his cranium warm albeit somewhat un-protected in the event of mishap. Turn the page and the eager reader is welcomed to the works of Messrs Bartholomew's Geographical Institute, ".. specially planned for the development of their particular class of work, equipped with the finest machinery and the latest appliances calculated to aid in perfecting the various processes of Drawing, Engraving, Lithographing, and Printing of Atlases, Maps, Plans, and ever kind of Cartographical work", the staff of whom worked under the supervision of Mr John Bartholomew, F.R.S.E., F.R.G.S., Cartographer to the King. "As a motorist one tries many maps, but always comes back to the matured opinion that Bartholomew's are the Best"
"No one who has any knowledge of the productions of the various firms who issue Road Maps can have the slightest hesitation in preferring Bartholomew's"
The Autocar - "The smallest names are easily and clearly read, and in this respect Messrs Bartholomew set an example which might be followed with profit by many other map producers". Motor News - "It is almost a work of supererogation to say anything in favour of the Excellent Maps issued by this Eminent Firm. Nothing better has ever been published." Return to the motoring collectables page for more unusual items that relate to motoring in some way.